The 2012 Chevrolet Caprice PPV is a futuristic cop car with 4G communications and a Knight Rider-like voice interface. It also automatically scans every license plate in its line of vision for warrants and unpaid tickets. Police cars have come a long way since Car 54. Motorola Solutions, one of the world’s leading security communications technology firms, recently unveiled a blinged-out next-generation cop car. The heavily modified 2012 Chevrolet Caprice PPV and Detective vehicle retails for approximately $30,000 before bid and bulk discounts and functions like a mobile police station. Motorola’s re-outfitted Caprices feature a full array of cameras and an immersive computer system that turns it into, as CTO Paul Steinberg tells Fast Company, a “virtual partner.” It’s also the only way to purchase a Caprice here in the United States: General Motors discontinued the car in 1996 for civilian customers. General Motors and Motorola collaborated closely on the vehicle. 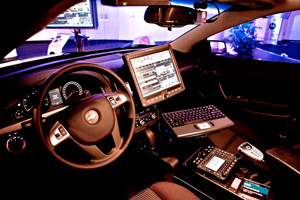 In a car fully equipped with Motorola’s accessories, the siren and computer applications can be activated via voice commands (yes, Knight Rider-style) and an in-car video system is fully integrated. The video system can record, stream, and receive video from external cameras such as street cameras. In order to save space, the bulk of the car’s computer hardware is stashed in the trunk. A push-to-talk button is integrated into the steering wheel for easy communications, and all of the car’s functions can be controlled via voice. Multiple cameras (up to eight) constantly take footage of everything surrounding the vehicle and inside the vehicle; just for that special Big Brother touch, an automated license plate recognition system can automatically scan every license plate that the car is in visual distance of, and check it against a database. If a car is tied to an unpaid ticket, known felons, warrants, or any other risk factors, the Caprice will flag it automatically and alert the officer. Police departments will also have the option of keeping a permanent database with information on every car spotted on the road and its physical location, a move sure to raise justified concerns among civil liberties activists. The system is equipped to process between 8,000 and 10,000 license plates per shift, the typical number encountered by a busy highway cop. Law enforcement equipment, including vehicles, is a lucrative business. The multibillion dollar industry is subsidized by government grants and allows police departments in many municipalities to regularly buy new vehicles. Fast Company reported previously on the NYPD’s hybrid patrol cars and Carbon Motors, an Indiana-based firm building a similar futuristic police car to Motorola’s. However, Carbon Motors has been dealing with a bumpy political path that included a surprise loan refusal from the Energy Department. The eight cameras on the Caprice can both cache video and stream footage back to a police station in real time, allowing multiple views of sensitive situations. 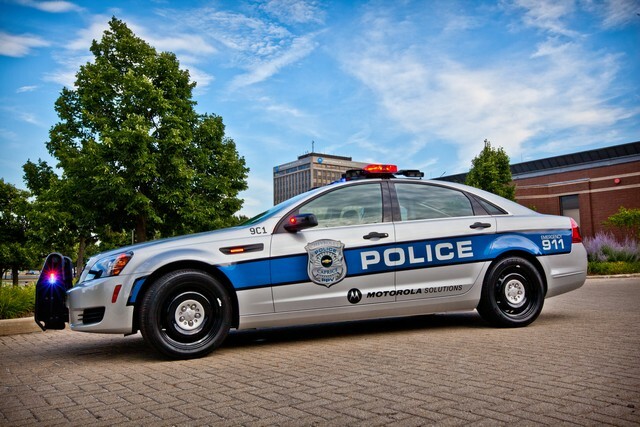 In order to handle that sort of bandwidth, the vehicle is fully integrated with Motorola Solutions’ Public Safety LTE networks, which gives individual police departments and law enforcement agencies access to high-speed 4G communications. Motorola markets a companion device, the LEX 700, to law enforcement agencies as well. The LEX 700 is a smartphone-like minicomputer that gives officers access to automated ticket writing, identity verification, evidence management, and suspect booking. Motorola’s cars are American adaptations of another General Motors vehicle, the Holden Caprice from Australia. Chevrolet is also making an unmarked version available for detectives and undercover officers. As always, it’s important to note that Motorola Solutions is a separate company from Google’s Motorola Mobility; the two companies parted ways in 2011.